Distributed by: Sterling Publishing Co. Inc. This book is pretty much what it's title implies - 30 different intarsia patterns. 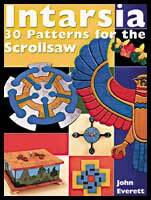 There are three very short chapters on materials and equipment, scroll saw basics, and safety. The remaining part of the book is devoted to patterns and projects which is what one would purchase the book for in the first place. First glance through the book was less than impressive. The patterns all appeared to be very simple and directed toward the beginning scroller. Also, most of the projects were (Yuk! ), painted in bright, livid colors which I found to be a real turn off. However, I usually try to do at least one project from a book such as this so that I may report on the pattern itself. When I started back through the book looking for that pattern which I would attempt, it became evident that although there were some very simple projects that did not appear to offer much of a challenge, the projects became increasingly difficult as the book progressed. Also, it was evident that one does not have to paint the pieces but could select different colored and textured woods which is certainly more in line with my appreciation of intarsia work. With each project, the author leads the reader through it with words, pictures, and a pretty good "how to" narrative. As I read more thoroughly and studied the patterns, I became more and more impressed. Indeed, there was something here for all levels of scroller. Also, the subject matter varied significantly from practical items such as clocks, coat racks, mirrors, etc., to games, to purely decorative items. Actually, one would be hard pressed to not find something he or she would like to try. Somewhere during my review, my impression of the book changed from a thumbs down to a thumbs up rating. While I doubt the professional scroller would care much for the book, most of the rest of us would find the book well worth having.